Pineal and Retinal Relationships presents the proceedings of the Symposium on Pineal and Retinal Relationships, held in Sarasota, Florida on May 3–5, 1985. 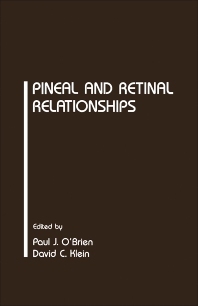 This book looks at the features that the retina of the lateral eyes and the pineal organ share, including biochemical processes, photoreceptive structures, biorhythmic phenomena, and physiological functions. This text also discusses the general and complex concept of photoneuroendocrine systems. Organized into 27 chapters, this book starts with an overview of the basic features of retinal and pineal receptors. It then proceeds with a discussion of the environmental factors that vertebrates use as cue to synchronize their circannual and circadian rhythms by which they adjust their physiological, behavioral, and biochemical functions. Other chapters consider the melatonin synthesis in vertebrates, which allows them to sequence physiological events into closer temporal position with seasonal climatic changes. This book is a valuable resource to optometrist, neurologist, neurosurgeons, photobiologists, ophthalmologists, and eye care professionals. Interstitial Retinol-Binding Protein (IRBP) in Rat and Bovine Pineal Organs: Evolutionary Vestige or Functional Molecule?